I don’t know about you, but I have to give that Molly Wizenberg a big ball of credit for her ability to make me feel like what I’m about to share with you is something a friend told me at lunch instead of something I just read in a book. Her blog Orangette is a warm and funny favorite and never fails to turn me on to something funky and fresh that I had either forgotten to look into or had never heard of at all. 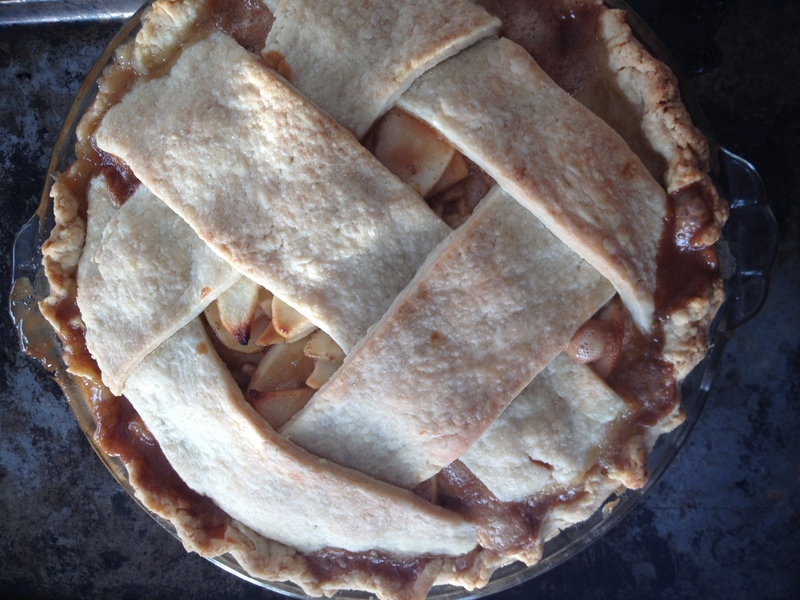 And, she links it all up so nicely, I don’t have to do a thing to get right to the good stuff. Molly’s book A HomeMade Life was one of my favorite reads this summer. 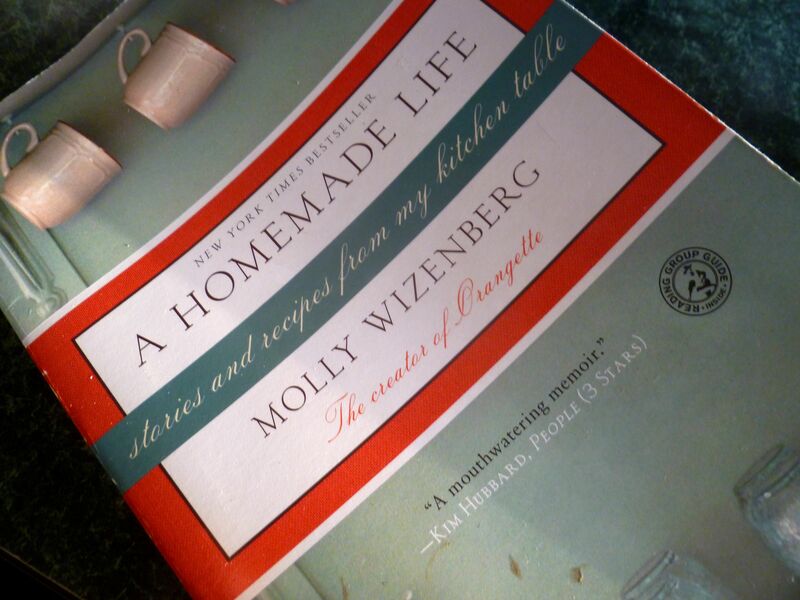 In the book, Molly tells the story of the pickles she and her husband made for their wedding and shares the recipes. All the pickles sound pretty great, but pickled grapes? That one had my full attention. You really should read the book, but if you can’t wait that long, the printable recipe and a link to an excerpt from Molly’s book is here in our recipe archive. I was pretty amused by Molly’s husband Brandon’s vinegar habit and charmed by the special and personal touch the pickles added to their wedding. I mean the man has 30 different kinds of vinegar! I don’t have 30 different kinds of anything except cows. The great thing about pickle recipes is that they are forgiving as long as you don’t mess with the acidity. I followed the recipe as best I could without having the luxury of 30 different vinegar options and having to make do with a faded old jar of mustard seed left over from some pre-loaded decorative spice rack my mother got as a gift about 20 years ago. My grapes still have their seeds - next time I'll definitely take the time to cut the navel and remove the seeds. For this batch, you have two choices; swallow or spit. My grapes were home-grown Pennsylvania Concords gleaned from a friend’s yard. The flavor of the grapes was pretty exciting and rich – but the skins are a bit more rubbery than supermarket grapes which I actually think added a little extra oomph. It was my first time tasting home-grown grapes like this and I admit I was a little excited. You won’t find grapes with rich Concord-y flavor like these at your supermarket. Following the recipe, it would have been going the extra mile to seed them and cut the navel out as Molly does, but going the extra mile last night would have meant never starting the first one, especially since my grapes have seeds. So, when you try my grapes, you have two choices: swallow or spit. I’m glad I threw perfection out the window and was extremely satisfied with good enough. Having never made them, I wasn’t sure they warranted the effort of all that seeding and navelling prep work. Next time, I’ll do it happily; they’re absolutely worth it. These grapes have officially been added to my list of pantry must haves. Now I just have to figure out how to grow my own Pennsylvania grapes, preferably the seedless kind. Now that these pickles have my full attention, I’m inspired to assemble the perfect bite. They paired well with last night’s chicken and are addictive with a thin slice of crystal-ly aged cheese like Parmesan Reggiano or super sharp cheddar. These grapes could bump a sandwich into a whole new galaxy. But most fascinating so far has been pairing my pickled grapes with deep, dark, rich and heavy chocolate things like flourless chocolate cake, ganache, dark chocolate fudge, that sort of thing. How do I know this?? Purely by accident, my spoon happened to brush against dark chocolate frosting before dipping into my grapes. The mixture of the dense, fudgy frosting and the vinegary, grapey liquid was really pretty amazing. Where I’m headed with this I have no idea. Truffles? Double chocolate individual flourless cakes served on a puddle of pickled grape juice? Homemade dark chocolate cordials with a pickled grape and plenty of juicy goop inside? 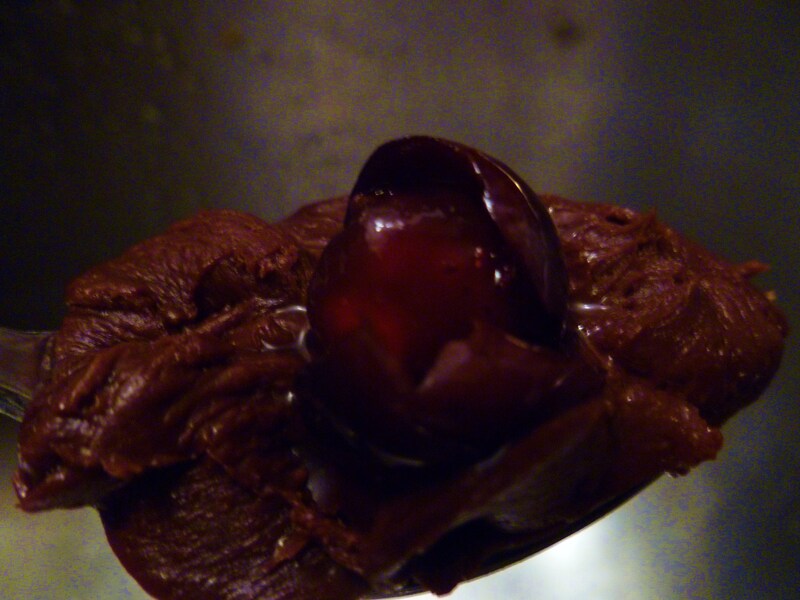 Or maybe just a spoonful of said chocolate frosting out of the fridge with a pickled grape perched on top and drizzled with plenty of juice…..
Pr-ETTY addictive. 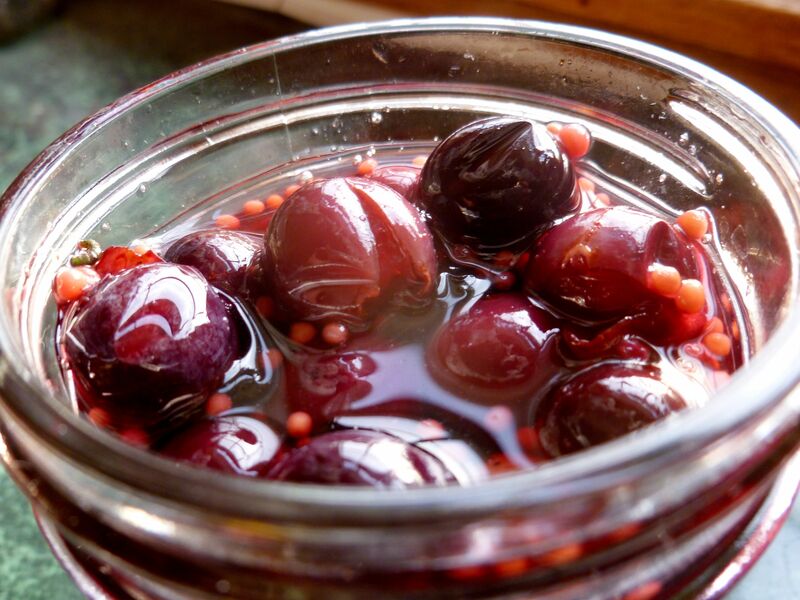 How would you eat a pickled grape? Sounds like a must have book to me. 30 different kinds of vinegar? Amazing! I make my own cheese and these pickles were delicious with homemade Brie! Removing seeds is too much work. I have a couple of vines that give me grapes with huge seeds, such that no one wants to eat them. A search on the net reveled I could pickle them and pickle them I did. Since I was the only consumer, they sat in the fridge for some time and guess what – the seeds lose there puckering taste and actually add great texture to a sandwich or a salad! I always have curious guests wanting to know what that interesting crunch in the salad was! That’s good to know Anita. Nothing like a salad with a variety of texture and flavors. I LOVED the grapes. Try them with dark chocolate. I had planned to do cordials with them but haven’t gotten around to it yet. 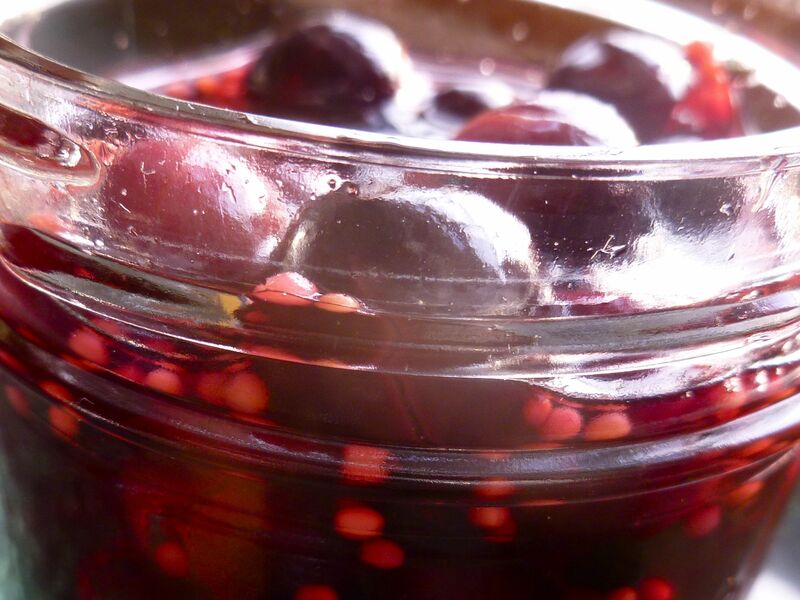 Better make another batch of pickled grapes or it won’t happen this year either. I love concord grapes too, but my recent experiments with grape pie were disappointing. Almost sickening, which was a huge let down – I was very excited about the idea, lol.